Racer Pace Stick Rosewood. We can provide rosewood pace stick off the shelf from sizes 37"- 42". Other sizes and colours. genuine military issue sticks on the market. This years World Pace Sticking. It will be supplied with a cotton protective cover. Pace Stick Military Racing Pace stick Premium Range Rose Wood Color Screw Lock. Here I have a Pace Stick Stand for sale. This stand is 445mm long, 90mm wide and 75mm high. Finished with three coats of silk finish varnish. Miniature Pace Stick Desk Stand. An ideal gift for any NCO or anyone who has ever swung a pace stick in anger. However, we. Made from solid hard wood in a rosewood finish. other colours. Army Military Pace Stick Drill . Condition is New. Dispatched with Royal Mail 2nd Class. Pace Stick Natural wood Finish colour with brass fitting. The step length adjustable from 12" 21" 24" 27" 30" 33" 40". Pace Stick Natural wood Finish colour with brass fitting. Spring locking system. The step length adjustable from 12" 21" 24" 27" 30" 33" 40". This item is untested. guideline only. 20 pace stick badgeS, good quality and detail. exclusive to me.. PACE STICK. All my badges are made in the uk and are of good quality. you are buying 20 badges at less than cost price. as can be seen - the detail on these are excellent including the "pin effect" at the top and base ect. Part of my downscaling of militaria items. I have on offer; A vintage wall plaque displaying the crest/badge of The RAOC with the badge, rifle and pace stick. The plaque is in excellent condition with no major damage. There is very light wear to the wooden plaque as you would expect. This plaque is in excellent display condition. Measuring 18cm x 14cm approx Please see photos which will assist with the description. I will be displaying other vintage plaques, so please take a look! A genuine article from a smoke free home. Military Pace Stick Beech wood brass polished fittings Size 42"+soft carry case. Military Pace Stick Beech wood brass polished fittings Size 42". Scots Guard Rifle To Ground. 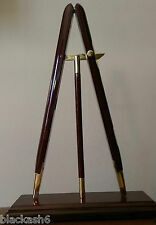 Military Pace Stick Beech wood brass polished fittings Size 40"+soft carry case. Military Pace Stick Beech wood brass polished fittings Size 40".